Small businesses need to run their websites properly to get the most visibility when it comes to an overall marketing strategy. Creating and maintaining a website is a low-cost marketing tool that doesn’t need extra advertising revenue beyond just keeping your website active. Small businesses, such as restaurants, local retailers, boutiques and service providers, should focus on affordable local SEO strategies to get the most out of their online presence. More and more people own smartphones, and those potential customers search the web through those mobile devices. Your website must be optimized for mobile viewing, and you should make sure it appears in the right online searches when people try to find your small business. It doesn’t take much to get on a cheap monthly SEO plan with our company. It’ll help your website increase organic search traffic. Approximately 94 percent of smartphone users search for local information through those devices. Your traditional website may not appear on these phones because it looks unwieldy when it’s not optimized with the right dimensions, fonts, and graphics that fit onto a smaller screen. You reach many more customers when your website is ready for mobile viewing. Even a cheap local SEO service should be able to optimize your site for cell phones. Web search companies all have programs, called algorithms, that catalog and rank websites based on various criteria. More and more of these companies take into account website optimized for mobile devices. Mobile is just part of the local SEO puzzle. That’s why you need a company that will offer reliable SEO services to you. Have a comprehensive NAP strategy when it comes to your small business. NAP stands for name, address and phone number with area code. These identifiers show where your business is located. Just as no one can find your business in town without knowing the physical location, people searching the internet can’t find your website without seeing the address on your web pages. Even if you don’t have the budget for SEO, you could easily do this on your own. Each and every page of your website should contain your company’s physical address and phone number. This normally goes at the bottom of every page in the area called the footer. Instead of adding the address as an image, your website must have the address as part of an HTML code. Web search programs don’t pick up the address if it’s in an image or a graphic because of the way those images are formatted. For local SEO, your phone number must have a local area code as opposed to a toll-free number. It’s okay to include both if you want to reach a national audience. Web search companies pick up on the area code to determine where your business has a physical location. Why is a physical location important? Smartphones have GPS trackers, and GPS trackers use online mapping information. Online maps typically mine information from business names and address as listed on the official websites. There are other ways to get your location out there aside from listing your address on every page of the website. Add your local business to online directories such as the Yellow Pages or the Google My Business page. These directories increase your company’s visibility because it matches the address you put on every page. You probably have social media profiles on LinkedIn, Twitter and Facebook. Include your company’s full address on the profiles because, again, this gets your company’s address on more websites. When your business’s address shows up on more websites, Google and other search engines recognize this and they match these addresses back to your business name and official website. Make sure your address information is correct on review websites such as Yelp and Trip Advisor. These are great resources that produce more visibility for your local business. You can also add a few extra touches that make your company and its website more searchable. Also, look for any websites that are industry specific. For example, if you are a doctor, Health Grades is a good site to get on. Many contractor businesses get on Angie’s List. Make sure you claim your profile if one exists or create one. Google recognizes high-quality websites with the types of media included in the content. That’s because advertisements embedded in images and videos make more money as opposed to simple text-based ads. Google may increase your website’s searchability when you include images and videos as extra touches that accompany the text of your website. Local keywords are important when it comes to marketing your website. In your blog posts, mention the local city in which you live. Talk about what’s going on in your city or area to receive more attention from web searches. Also, make sure you create a few cheap SEO campaigns on Google Adwords so that you can increase the traffic to your site. That will help your organic traffic as well. You can run ads to the pages that you have written about your area. Mentioning all of these items creates local keywords that draw residents and customers to your website and allows for increased search visibility. Anytime you can give Google a reference to the areas you serve, it will help you rank for “near me” searches. If you have a brick-and-mortar business that your customers need to find, add directions to your website. If you don’t have a business like that, you can add directions to popular destinations in your area. The more local markers you give Google, the better. Do a turn by turn direction from major roads to where you want the reader to get. Localized social media works the same way. A post on Facebook or Twitter can mention your city name, a local event or the street where your small business is located. For example, a post about a restaurant opening for the day can read, “Good morning, Smithville! Stop by Main Street to smell the bacon and coffee going right now!” There are many ways to use local keywords on social media posts every single day. You could even set up a cheap SEO campaign through Facebook ads to boost your message. All of these strategies can get your small business noticed. When more people notice your company, your revenue and profits grow. Local keywords and SEO represent low-cost or no-cost ways to market your company. 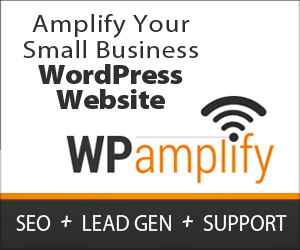 See how WPAmplify can help your firm take your online marketing strategy to a new level. We offer monthly SEO services that are always reliable.